The Moving Picture Blog: The few. The proud. The chosen. The critics. 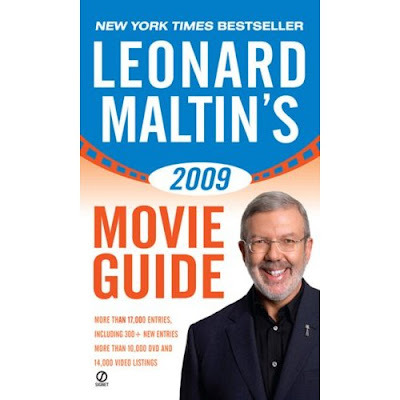 The 2009 edition of Leonard Maltin' s Movie Guide is now on sale at fine bookstores everywhere. And while it's always an invaluable resource, this year's edition is even better than usual because... because... well, hell, because I am one of the handpicked contributing editors who contributed mini-reviews (all of them, of course, personally approved by Mr. Maltin himself). You can order the book here. And remember: This book -- much like mine -- is the perfect present for any movie buff on your gift-giving list. And if you buy both of them? Well, it's like Peter Falk says in Wings of Desire: "If you do it together, it's fantastic." So how does that work? Are we getting your star review for a movie or Maltin's? I'm assuming you get the third stringers like Resident Evil 3. And quick, what did he give Iron Man? Third stringer? Hah! I should rank so high! But, oddly enough, yes: I wrote the mini-review -- and provided the star rating -- for Resident Evil: The Bottom of the Barrel (or whatever it was called). Also, The Comebacks, See No Evil, Who's Your Caddy... hey, do you see a trend here? Also, I fetched coffee for the other contributing editors.